Market Compound - Jerusalem rooms - it's a great house with exceptionally beautiful, fully furnished apartments for short and long stays. Located in the center of Jerusalem, near the market Mahane Yehuda in the historic district of Nahlaot, Apartment Market courtyard will help you to feel the special spirit of the present Jerusalem. The apartments are located a 5-minute walk from the city center and in close proximity to the Old City, next to the high-speed tram line and the other main types of urban transport. All apartments have framed a beautiful indoor patio, have a balcony with a beautiful view. The apartments are fully furnished with modern furniture, made to order, and have a fully equipped kitchen and other household convenience. Market Compound - Jerusalem accommodation offers 5 different types of apartments. Beginning with 1- and 2-bed studios, located on the roof, and ending bedroom apartments for families with children. For a more detailed description and photos are available here. Want to go on a trip to the fortress of Masada and the Dead Sea? Or, perhaps, to the Sea of Galilee? Looking for recommended personal guide? 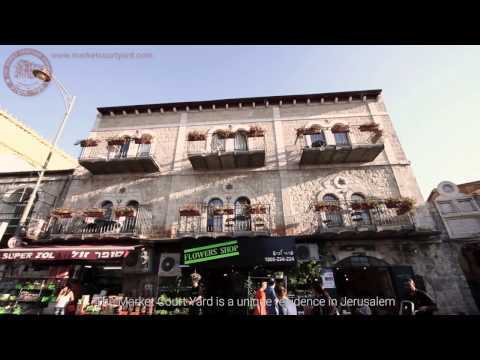 Would you like to reveal all the secrets of the picturesque Mahane Yehuda market? Click the link to get information about tours and guides, who are selected for you to manually staff Market farmstead that you get the whole set of impressions from visiting Jerusalem. You can sign up for guided tours directly from our site!